Riverside is the 59th most populous city in the United States and 12th most populous city in California. As of the 2010 Census, Riverside had a population of 303,871. 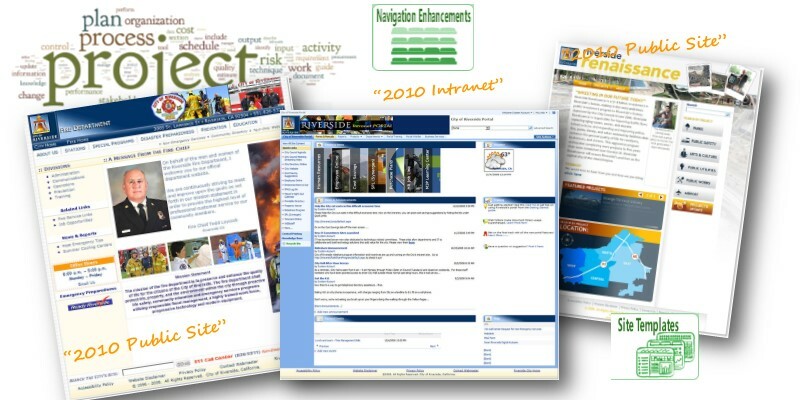 Riverside became interested in the use of SharePoint technologies for porting their current intranet, and possibly using it for their public website and several other business automation functions. After careful consideration and validation of our professional services, we were selected to undertake approximately six subprojects to be executed over the course of 2008. For about a year we worked very closely with the city of Riverside's IT department and became close working members of their team. We cannot say enough about the professionalism and dedication of the project manager Chris Tilden, who guided us through the many players, stakeholders, and politics of a large government service. We had several lovely visits to the beautiful city and came to know it and all the seasons, as we built public websites, intranets, and dug into process automation for several departments. Community outreach public site "the Riverside Renaissance website"
A SharePoint-based website was created for a content management system. A unique look was used to create a dynamic website and to communicate what is happening and the benefits to the community. We provided assistance with design and development to the city's team, hosted the site, and later deployed it to the client location. Features included: What's happening by timeline, by neighborhood, type of project, or expense. Provide training/customization on how to best make use of the core features of MOSS 2007. SharePoint public portal design and development with workflows, and several public-facing content management sites. Their current HTML site was converted to SharePoint CMS for the city fire department. This project was a conversion of an HTML-based website into a SharePoint content management system so that fire department staff could more easily update and manage their website content. SimpleSharePoint provided design and development along with consulting and training. Police department automation of staff training requests. We provided design and development along with consulting and training. The process starts with a user creating a request for training, filling out items such as course title, cost, location, time, the number of officers attending, etc. The workflow then takes the request and moves it through the chain of command (8 levels) to get approvals. Once the request is either approved or rejected, the request creator will receive an email that states whether the request was approved or rejected, the last person to approve or reject it (and all previous people), and their comments. We met our target objectives on time and within budget, but more importantly, we built a SharePoint foundation for future growth.